When talking to himself or talking to other people, Gollum likes to address himself as "we," e.g. : "we likes you". There is only one Gollum, so why does Gollum talk as if there are many Gollums? And his grammar is wrong as well. There should be no verbs ending in an "s" after "we." Is there any given reason for Gollum's nonstandard grammar and pronoun usage? It seems that there are two different explanations. Either the "we" refers to the ring and Gollum, or the "we" refers to Sméagol and Gollum? Sméagol: I don't know. I can't help it. Master's got it. Sméagol promised to help the master. Gollum: Yes, yes, to help the master: the master of the Precious. But if we was master, then we could help ourselfs, yes, and still keep promises. Sméagol: But Sméagol said he would be very very good. Nice hobbit! He took cruel rope off Sméagol's leg. He speaks nicely to me. Gollum: Very very good, eh, my precious? Let's be good, good as fish, sweet one, but to ourselfs. Not hurt the nice hobbit, of course, no, no. Sméagol: But the Precious holds the promise. Gollum: Then take it, and let's hold it ourselfs! Then we shall be master, gollum. Make the other hobbit, the nasty suspicious hobbit, make him crawl, yes, gollum! As you can see, "we" is used by the Gollum persona, and the Gollum persona is the one that constantly uses the "my precious" expression. 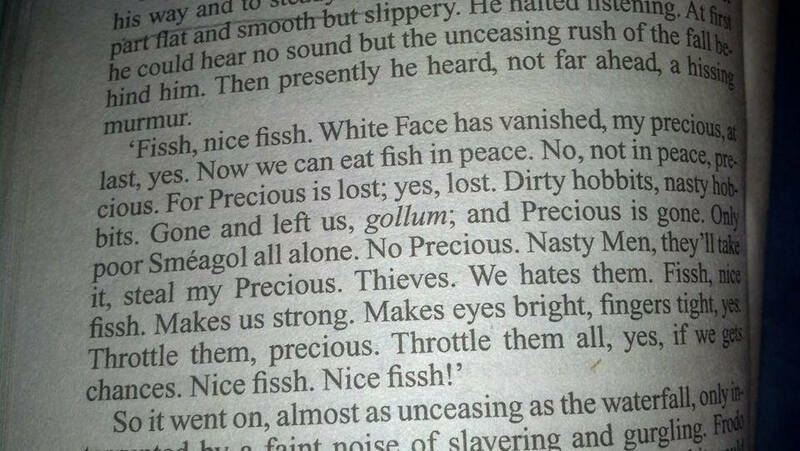 The Sméagol persona uses I instead of we, and pretty decent grammar by comparison, and never uses the "my precious" affectation. From the above dialogue, at first glance, it seems an open-and-shut case that the "we" refers to Gollum and Sméagol. But I don't think this is true. "It's no good going back there to search, no. We doesn't remember all the places we've visited. and it's no use. The Baggins has got it in its pocketses; the nassty noser has found it, we says." "We guesses, precious, only guesses. We can't know till we find the nassty creature and squeezes it. But it doesn't know what the present can do, does it? It'll just keep it in its pocketses. It doesn't know, and it can't go far. It's lost itself, the nassty nosey thing. It doesn't know the way out. It said so." "It said so, yes; but it's tricksy. It doesn't say what it means. It won't say what it's got in its pocketses. It knows. It knows a way in, it must know a way out, yes. It's off to the back-door. to the back-door, that's it." "The goblins will catch it then. It can't get out that way, precious." "Ssss, sss, gollum! Goblinses! Yes, but if it's got the present, our precious present, then goblinses will get it, gollum! They'll find it, they'll find out what it does. We shan't ever be safe again, never, gollum! One of the goblinses will put it on, and then no one will see him. He'll be there but not seen. Not even our clever eyeses will notice him; and he'll come creepsy and tricksy and catch us, gollum, gollum!" "Then let's stop talking, precious, and make haste. If the Baggins has gone that way, we must go quick and see. Go! Not far now. Make haste!" Notice that though we can posit two speakers, the grammar doesn't change. The term "precious" is used repeatedly by only one speaker, but the pronoun "we" is used by both. Other than the term "precious", there's no clear distinction between the two speakers as there is in the Gollum/Sméagol dialogue. The Sméagol personality doesn't appear to have manifested itself for a long time, dozens or perhaps hundreds of years, until Frodo addressed Gollum by the name of Sméagol and briefly revived Gollum/Sméagol's memory of his old self. Thus "we" refers to Gollum and the One Ring, and not to Gollum and Sméagol. The dialogue from The Two Towers is an exception to the rule. He has a split personality - Gollum and Sméagol. The ring warped the original nice hobbit Sméagol into the evil Gollum. The two different personalities are in conflict for control. It is because he has spent so long with the ring, and has listened to its dark whispers to the point that he has embodied it with personality and individuality. We refers the the ring and gollum. I've just looked over some of the script, it appears Nim is right. Smeagol refers to himself and Gollum as 'we' for the most part, except near the end of this excerpt, where he slips and says me. Gollum on the other hand refers to the pair as 'us' throughout. Clearly if the Precious belonged to 'us', the sentence structure is wrong, even for Gollum/Smeagol. So perhaps it was just his manner of speech to begin with! - the fact that Gollum is a split personality, and in some respects sees himself as more than one person. - the fact that he views the Ring as an entity that is also part of himself, so can be referring to Gollum/the Ring. - the "Royal We"; as the Keeper of the Ring, Gollum sees himself as special, almost regal, so in some ways speaks as Royalty would. The current answers here have missed some key points that I believe help resolve a number of the questions regarding the plural pronoun uses. Let me reproduce the same quote from the currently accepted answer that was used to make a case that "we" referred to the Ring from The Hobbit. I've bolded all the places where the Ring is being referenced and kept italics for the plural first person pronouns, then also highlighted the three times precious is used by itself. A number of points show that "we" in this passage is never referencing the Ring. Clearly, Gollum refers to the Ring multiple times in the third person as "it" (x7) and "the present" (x2) and "precious present" (x1). Some of these are in the immediate context of using a "we" or "our." In the final paragraph noting the Ring, Gollum even is postulating that a goblin will get a hold of the Ring, and then says "We shan't ever be safe again" and "Not even our clever eyeses will notice him," which are both clearly indicating the plurals are referring to the split Sméagol/Gollum persona. Both sides of the split persona use the "we," as seen in the first two paragraphs of the exchange and the last two, each being a different speaker, but each using "we." The precious term here, when used as a nominative, is the special term of one side of the personality (Gollum) towards the other (Sméagol), though that is not as clear here as in later writings where it is clear Gollum uses that term. However, the last paragraph "Then let's stop talking, precious" clearly shows the "precious" is referring to the other personality by the inclusive "let's" and the fact that the Ring is not in his possession and has not been part of the conversation. The one use of "precious" as an adjective refers to the "present" of the Ring. I won't go so far to say that "we" is never a reference to the Ring in Gollum's speech, as I have not examined all the cases. But clearly here it is not, and I think likely in most all cases, if not all, it is not. It has nothing to do with split personalities or the Ring's effects on him. It seems that this is just the way he always spoke. Smeagol didn't have a split personality until after he took the Ring as his own. Yet when Deagol first finds the Ring, what are the first words out of Smeagol's mouth? - The Fellowship of the Ring, Book I, Chapter 2: "The Shadow of the Past"
Only once does he use the plural to reference himself, using "my" (x3) and "I" (x1) also in the passage. That initial "us" comes immediately upon the Ring's first influence upon Sméagol; the Ring is already drawing him (and Deagol) to covet it and keep it. This strongly indicates that the Ring's influence may indeed have something to do with the manifestation of "us" in the request. The Ring influences from a (short) distance, so Sméagol not yet having had possession of the Ring does not mean its influence is out of scope for this encounter. Sméagol was clearly of "weak" character, being quickly and easily influenced by the Ring to kill Deagol over it. This last quote distinctly indicates that the plural reference was related to Sméagol's alternate persona having influence over him, since Frodo observed (and Tolkien thus hints through him) that the singular "I" manifested in those places when the Gollum persona had lost influence. "We" is primarily, if not possibly exclusively, a Sméagol/Gollum reference; it is a habit brought about from the first influence of the Ring upon Sméagol, but manifested more and more as he became isolated from society and had only "himselfs" as company. I can offer an out-of-universe answer AND an in-universe answer. The out-of-universe answer first: Anyone who lives in the British Isles can tell you that it is not uncommon to use terms like "us" and "we" to refer to oneself. Your wife might say "Give us a kiss" (meaning 'Give me a kiss'); a patron in a pub often says "Give us a pint of the black stuff" (meaning 'Give me a pint of Guinness'). Substituting "we" for "I" is less common, but not unheard of. The British monarch uses the "Royal We" in official speeches, as another answer mentioned. Commoners use it less frequently, but it still isn't completely unheard of. In a slightly different context, it is sometimes used in the states as well. I can recall the morning after I graduated from high school; I slept at my friend's house and woke up horribly hungover from drinking too much the night before. My friend's mother opened the curtains, saw me wince at the bright sunlight, and laughed, asking "How are we feeling today? A bit under the weather?" She wasn't hungover, so the "we" obviously meant "you". This strongly suggests that this is simply the way Smeagol always spoke. It has nothing to do with split personalities, or with himself and the Ring being intertwined: he just talks like that, and he always did. Since the Shire is Tolkien's idealized vision of England before WWI, and people in Britain still speak this way on occasion, this isn't all that surprising. However, Gollum's habit of unnecessarily pluralizing words (I.e., "hobbitses") is very unusual; still, this quote supports the idea that he just talks like that and always has. Now we can eat fish in peace. No, not in peace, precious. For Precious is lost; yes, lost. -The Two Towers, Book IV, Chapter 6, "The Forbidden Pool". "...he always called himself "my precious"." -The Hobbit, Chapter 5: "Riddles in the Dark"
In Lord of the Rings, "the enemy" refers to any opponents, while "the Enemy" always refers to Sauron. This passage also displays Gollum's penchant for unnecessarily pluralizing words - he says "We hates them" rather than "I/We hate them". There isn't a deeper explanation here - he speaks this way because this is the way he speaks. It really is that simple.